During our visit to this stall, we will meet Jesús, the manager. The business has been run by three generations of Juanes, starting with Juan Más in 1945 who then handed it down to his son, also named Juan, and now his grandchildren Juan and Jordi Más are the ones who take good care of the business. 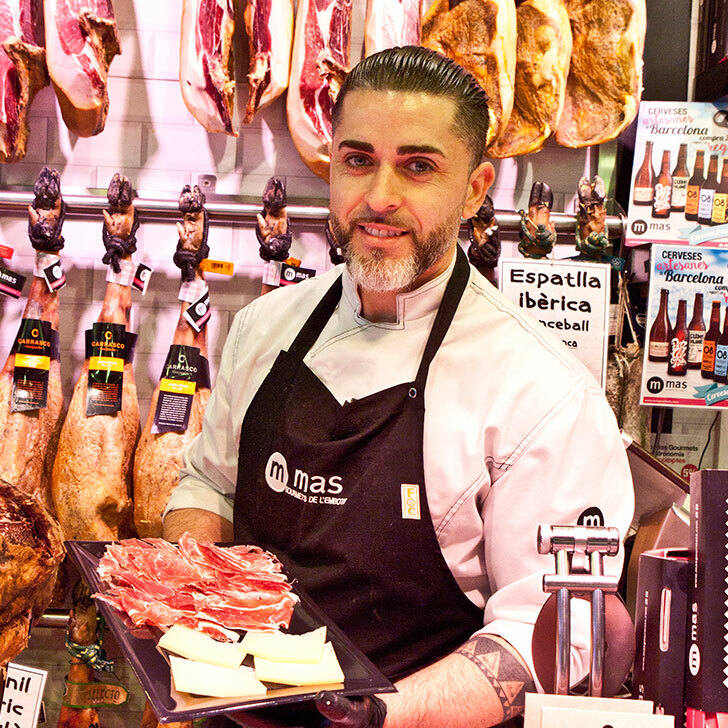 All these years of management experience passing down from one generation to another have made the Más family experts in identifying and selling premium quality ham. This background has also helped them get top-notch products thanks to the relationships they have built with the dryers, who have a unique and artisan way of manufacturing. For them, the crown jewel of the different types of ham is the Ibérico ham from acorn-fed pigs. This is because the method used by the dryers to cure it is one of the few remaining traditions. At the Mas stall they don’t take cheese for granted, as they have made an art of offering the best product to their clients. From the dry Manchegos from Castilla la Mancha, always in demand, to the delicatessen truffle Pecorino, they follow up all the products and try everything that comes their way to make sure they have the best of the best in their display. 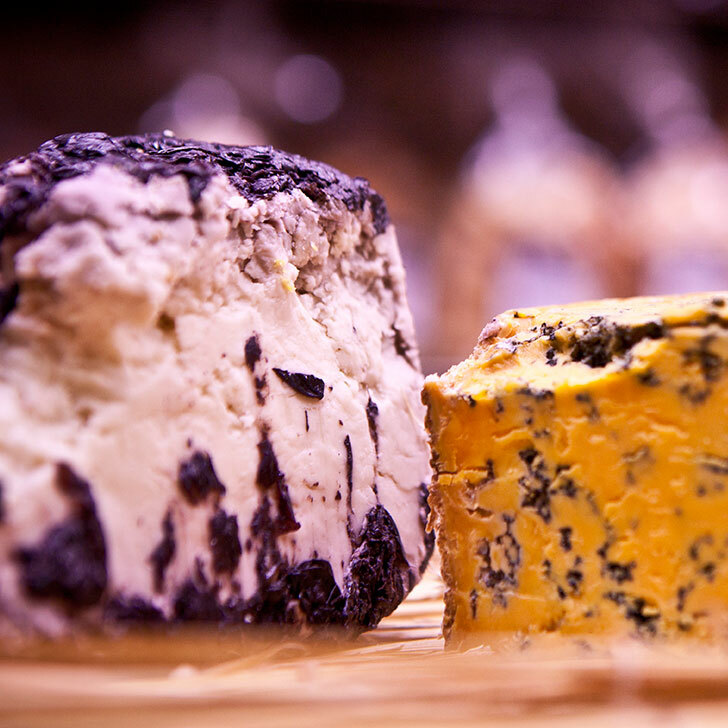 Also having top-notch local products is a must for them, such as typical cheeses from the Pyrenees and la Garrotxa. They want to have every cheese with different taste to satisfy all kind of palates. So whether you’re new to the cheese world or you’re an expert looking for the real thing, this cheese stall will satisfy your needs. He will tell you how to identify the best ham and cheese, keeping an eye on where it comes from, as each area comes with a different flavour. 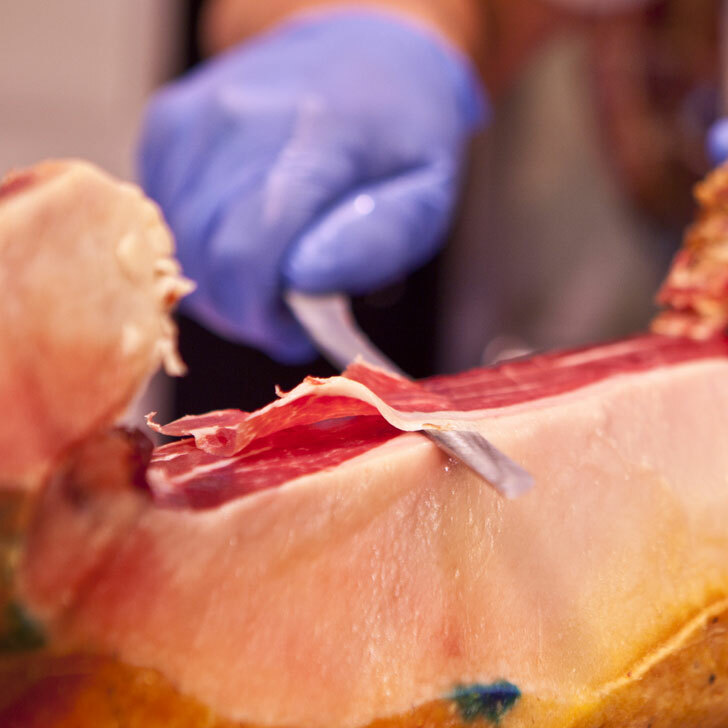 And if you eventually decide to take some pata negra ham home with you, he will show you how to cut ham like a pro, to get the most out of it! Olives Francesc was set up in 1947 when, after getting married, grandma Antonia and grandpa Antonio decided to run a business together. They started with a small olive stall outside the market and now they have four different stalls full of top quality products, with the third generation running the business. 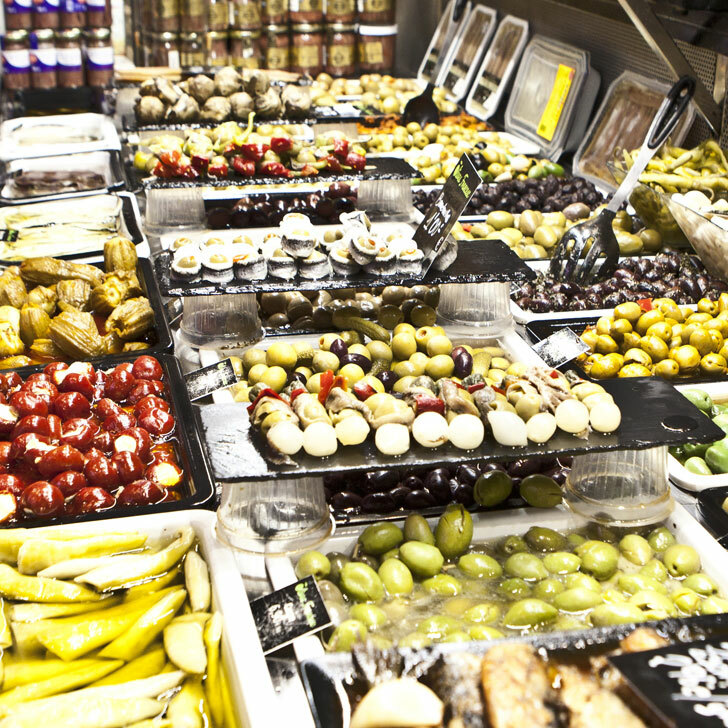 Their main products are olives, anchovies and olive oil. They also have the olives vacuum packed, which is ideal for travellers, as they try to keep up to date with the needs of their customers. That’s why they also spend the weekends looking for new products to try and add to their display. Their best reward is to see their clients coming back for more of their products. 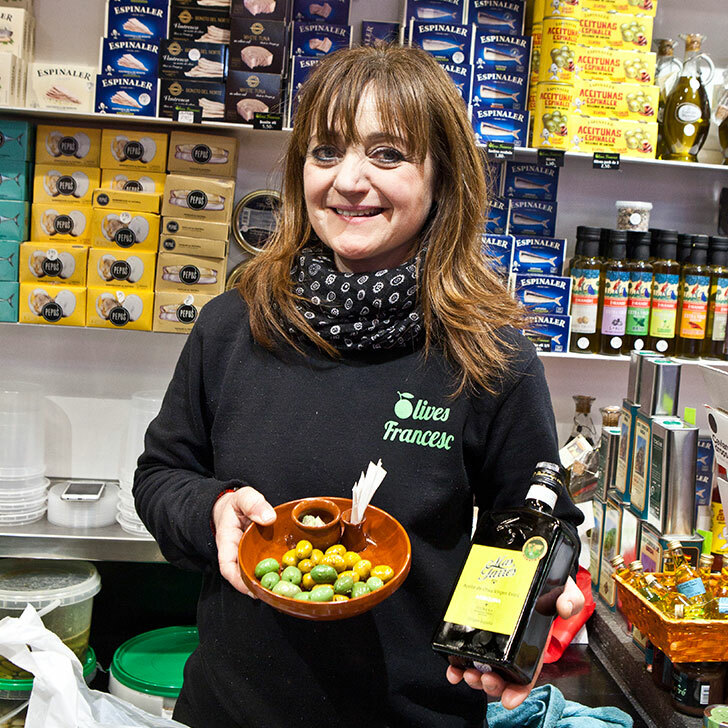 And they do come back because the customers know that Olives Francesc loves to spoil them by letting them try all kinds of olive oils and olives until they feel they’ve found the one that is right for them. She will set a typical Catalan aperitif, and tell you all about the different types of olives, their origin, texture and flavour and what you can use them for. For example, how to identify olives meant for cooking, those for making olive oil and those to be eaten raw. And, of course, you’ll be able to try all of them and find your favourite type! The brothers Javier and Juanjo Morilla are winery owners who arrived at La Boqueria in 2001. They used to own a grocery store but they soon transformed the business by specialising in wines and were very successful. 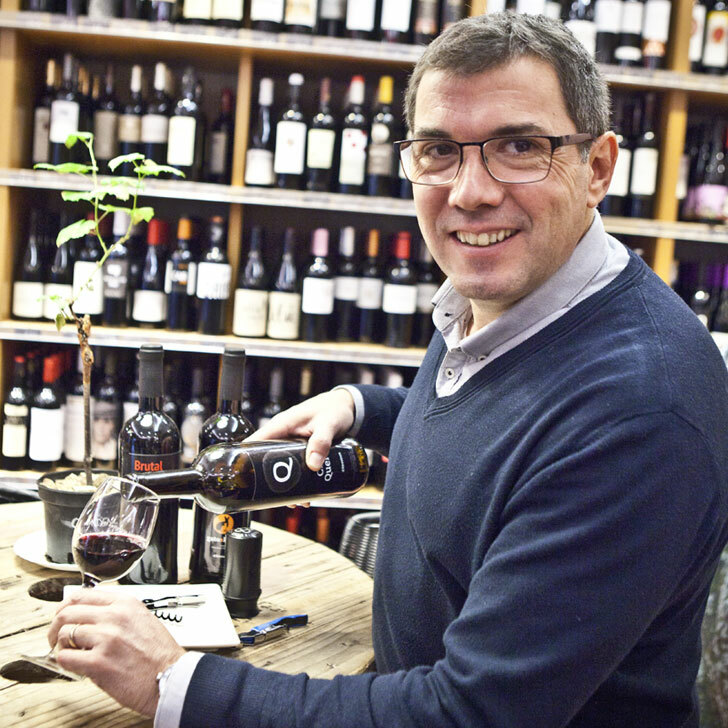 Besides selling a wide range of wines, the products they like most are cava because it is still relatively unknown and local wines, which are in great demand. 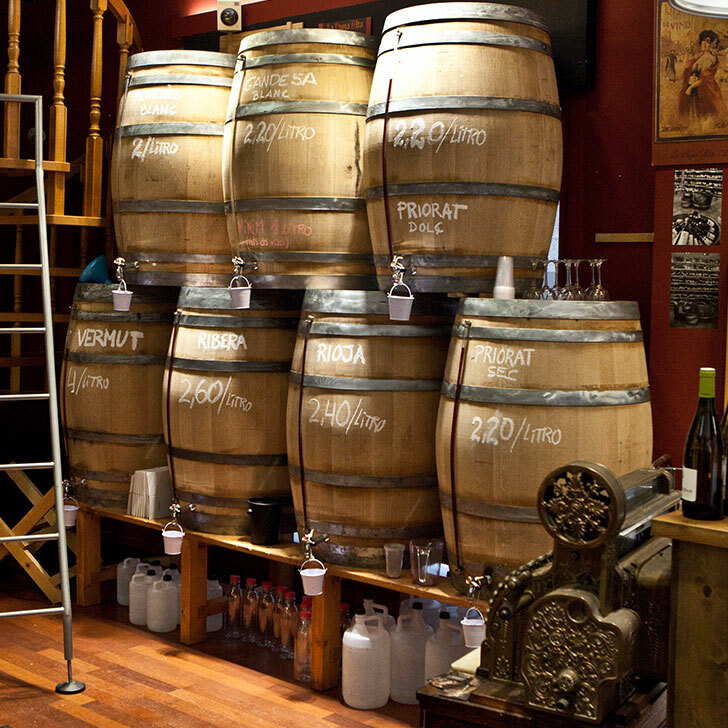 They know that people like to try local wines, as when people travel to a certain place they want to know what local products taste like, as a way to discover the city through its flavour. So they became experts in offering the best of their land. They’ve been making a name for themselves by obtaining the best products. Getting first quality products for the stall takes up a lot of time and entails forging a reputation as a trustworthy company. Then, after all this, the wineries start to trust you and everything comes together naturally. They will unveil to you all the secrets of wine and teach you how to taste a wine by watching, smelling and tasting. You’ll learn how to pick the right wine for every meal and whether it’s a good one in two sips, as the first one is for preparing the palate, according to the experts! We took part in the tour and liked it very much. We followed their restaurant recommendations and thought they were excellent.